Jim Keelan eyed the clouded, dark November sky. The evening chill carried the threat of a killing frost. It made no difference though; tonight was his turn to guard the railroad bridge. But as he stood there listening on the Strawberry Plains side of the crossing, he heard only the wind above and the river below. On the far side of the bridge, just one other sentry stood guard. Months of rumors and warnings that the bridge would be burned had kept nearly a dozen men detailed to guard it. But the bridge had remained uncontested. Finally, two days earlier, with soldiers badly needed at other points, the bridge guard was suddenly reduced to a single sentry at each end. Had the threat to destroy the bridge lessened? Keelan climbed down beneath the bridge to the "box or bunk" that served as his post. Here, secreted behind the supporting timbers and just above the abutment, he could remain hidden yet hear and observe anyone approaching. In case of trouble, a musket, single-shot pistol, and Bowie knife lay nearby. Slowly, the hours passed. As he had little contact with his distant counter-part across the river, he was essentially alone in the dark, captive to the dull and lonely vigil of his post, a watch interrupted only by the occasional thunderous passage of a locomotive overhead. Was it midnight yet? From his dark, silent watch post beneath the bridge, Jim Keelan peered into the gloom of what promised to be another boring, sleepless night. He had learned from earlier experiences that night sounds coupled with a healthy imagination often produced an army of marauders, when instead the rustle of leaves and sound of steps proved nothing more surprising than a sudden breeze or a solitary buck. But what was that? Footsteps? Somebody was coming! The definite sound of boots tramped closer, not just one man but perhaps dozen! Through the darkness and around the abutment of the bridge, figures moved swiftly into view! Jim Keelan watched in silence, straining to hear their talk. Suddenly a form mounted the pier just feet from his hiding place and in the next instant struck a match and ignited some pine splinters! Intent to thrust the burning kindling into the scantling and weatherboards of the bridge supports, the saboteur never saw the quick hand with the single-shot pistol that flashed from the shadows. With his gun just inches from the right breast of the would-be bridge burner, Jim Keelan pulled the trigger. The blast killed the man instantly and extinguished his torch, sending him tumbling down on the startled crowd below. In the pitch dark, Keelan drew back to the protection of his bunk as cursing men fired wildly in his direction. Frantically, in order to defend himself, he grabbed for his musket, but in the chaos found only his knife. Dark forms scrambled toward him, some striking and slashing with heavy knives, others shooting as they mounted the wooden beams. Holding his left hand up to protect his head and face against the multiple blows of his closest attackers, Jim Keelan swung his Bowie knife in a wide arc. Again and again he made them feel his steel, a fact made certain by their screams and curses and the wrenched tugs on his blade. But he was hopelessly outnumbered. Combating so many, this became a fight for life as well as for a bridge, one desperate man against many. And already he knew he was hurt; the salty taste of blood was on his tongue. They came, shooting, slashing, hacking, and cursing. "At him again," came a voice from the dark. "Let me at him and I can fetch him," swore another. But for at least one, overconfidence proved fatal. When one of the closest attackers missed Keelan's head and instead buried his knife into a support brace, Jim grabbed the man, pulled him close, and thrust his blade deep into the attacker's side. As this foe tumbled in death to the ground, another lunged out of the dark. A sudden blow knocked Keelan backward and a second strike sliced his scalp to the bone. Desperately Keelan grappled with the figure, blinded by his own blood. With a sudden parry; he lost his balance, crashed hard against the weather boarding and nearly fell from his perch. Blocking his opponent's knife with his left hand, he felt a searing pain cut deep through his wrist. Yet in this moment, he made good his own thrust and as he would remember years later, "I poked it into him and he got the steel good." "Let me up there, boys, I'll fix the damn rebel!" bellowed a voice from the dark. They were coming again! But Jim Keelan was badly hurt. Frantically he grabbed again for his musket. But there was no time for the gun, especially with his limp, numb left hand. He locked his right hand around the knife and as yet another dark form surged out of the gloom, he wielded his blade with renewed defiance, deeply cutting the man. Staggering, this last assailant fell back and screamed for his men to shoot the rebel down. Perhaps a dozen shots smashed into the beams and planks around Jim Keelan; three of them found their mark. Badly hurt by his wounds and cuts, faint with loss of blood, and stunned by the brutal and overwhelming attack, the sentry pulled himself up and finally grabbed his musket from the rack in his bunk. Frantically he fought to shoulder the weapon, to brace in on a beam, but found he "could not lift it." It made no difference. The bridge-burners had had enough. Lights in the windows of a nearby house warned that the alarm was out. Confederate reinforcements would soon be near. Keelan, much closer to death than life, tumbled into a bloodied heap from his bunk beneath the bridge and crawled up to the tracks. In his desperate state, believing that he was mortally wounded, he might have inched toward the house with the lights, the Stringfield residence. But with incredible presence of mind--fearful of alarming its two female occupants--the badly wounded private crawled on to William Elmore's place. There, he pulled himself up at the gate and called for help. When Elmore reached Keelan, he recoiled in horror. "Jim, you've been drunk or asleep and let the train run over you." But Keelan replied, "No, Billy; they have killed me, but I've saved the bridge." And so he had! Three men were found shot to death or butchered in the bloody ground below Keelan's post the next morning. Various accounts at the time stated that another six to eight had been carried away badly cut. A local physician, Dr. Sneed of Strawberry Plains, worked on Jim Keelan throughout the night to save his life. He found three severe sabre cuts to the scalp, a gunshot wound in the right hand, right arm, and an inoperable bullet in the left hip. Yet it was Keelan's left hand that proved the greatest loss. Seeing the hand hanging by a mere sliver of flesh, Dr. Sneed knew the hand could not be saved. Grimly, he offered to remove it and neatly stitch the stump. Jim shook his head and in his matter-of-fact-fashion, replied, "No, no, I can rest a gun against that stump." In the years after the war, most of the local folks in the Holston Valley-in Bristol, Kingsport, or Knoxville-heard of the one-handed man who had alone repulsed the bridge-burners that November night in the first year of the war. Yet somehow, Jim Keelan slipped into obscurity, scratching a hardscrabble existence from farming, wood cutting, and an assortment of odd jobs. His story might have been forgotten had it not been for a reporter from the Louisville Courier-Journal who heard of the escapade and sought an interview. There in Bristol, Tennessee, on January 6, 1894, he found his subject and heard first-hand the incredible story. After the reporter had completed his notes, he urged Jim Keelan to pursue a soldier's pension as offered by the State of Tennessee. Then he closed the interview with one last question. James Keelan received his soldier's pension, but on 12 February 1895, just 13 months after his newspaper interview, he passed away and was buried in East Ridge Cemetery, Bristol, Tennessee. On August 20, 1994, Pvt. 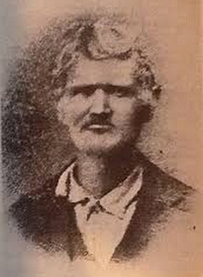 James Keelan was posthumously honored with the Confederate Medal of Honor for his stalwart one-man defense of the bridge at Strawberry Plains. His Confederate Medal of Honor is on permanent public display in the UDC Confederate Museum in Knoxville, Tennessee. "With instructions to guard the railroad bridge at Strawberry Plains against all marauders, Private Keelan single-handedly defended his post against an overwhelming enemy force intent on burning the bridge. Armed with but a single shot pistol and a Bowie knife, Private Keelan killed the first sapper at point-blank range. In the desperate hand-to-hand fight that followed, Private Keelan was shot in the left elbow, the right arm, and the right hip, suffered three sabre cuts to the neck and scalp, and had his left hand severed at the wrist. Despite these wounds, Private Keelan slashed to death two of his attackers and seriously wounded an undetermined number of the enemy before they fled the bridge." Adapted from this outstanding book, Valor in Gray: The Recipients of the Confederate Medal of Honor, by Gregg S. Clemmer. He also points out that East Tennesseans were divided in their loyalties and that slavery played only a small role. Groce goes too great lengths to expose the vile treatment of the Region’s defeated Confederates during the Reconstruction. Numerous maps, pictures, and tables underscore the research. Whether a descendant of the North or the South, this book will make you feel the emotion that drove these men to risk their lives for their values and beliefs. Each chapter is devoted to a separate Confederate Medal of Honor recipient. Valor in Gray is destined to be one of the best books on Civil War history.